Our mission is to create high-quality wines in a natural way and with traditional methods of cultivation, without any unnecessary chemicals. Our efforts in this respect start right in the vineyard, with correct attention to planting, pruning, care and harvesting, before delivering their results in the winery and cellar. Son Mayol takes full advantage of its favoured valley location and almost 50 acres of vineyards, spread over 35 locations. Exposure to all four points of the compass ensures a varying microclimate of sunshine, wind and rain; all of which contribute to the quality of the soil. This results in totally different wines – even with the same varieties of grape. In our modern winery we vinify the grapes from different terroirs one by one (primary and malolactic fermentation and ageing in barrels. During the final blending of the lots we wish to offer you to be our best wine, after maturing for two years in old oak barrels whose age and wood are adapted to the properties, we select the wine from the terroir to compose the final product. This enables us to produce quality wines suitable for further ageing and which improve over the years. They are both blends of grape varieties from Bordeaux, mainly Cabernet Sauvignon and Merlot and Petit Verdot, blended on a model of the blends of Bordeaux. These two top-quality wines are distinguished by the type of vinification used and by the ageing process in the barrel. The grapes from the different vines are vinified separately and then used in one of the two wines. This assignment is determined by the length of fermentation, the age of the barrels and thus the duration and type of maturing in barrels. Unconvincing grapes or wines which are not used by Son Mayol are sold on to other producers. As the wines of Son Mayol are often drunk on special occasions, a good part of our production is marketed in Magnum and Jeroboam-sized bottles. Its Mayol benefits from a combination of about 30 different “terroir”: differences in the soil clays, limestones, sands, lemons, all possible orientations, south/north/east/west with most of the vineyards being located on slopes, and different varieties. 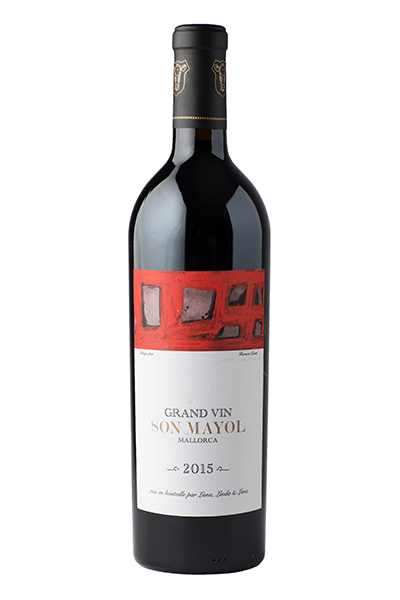 GRAND VIN SON MAYOL is a classic wine with a noble, full-bodied character. 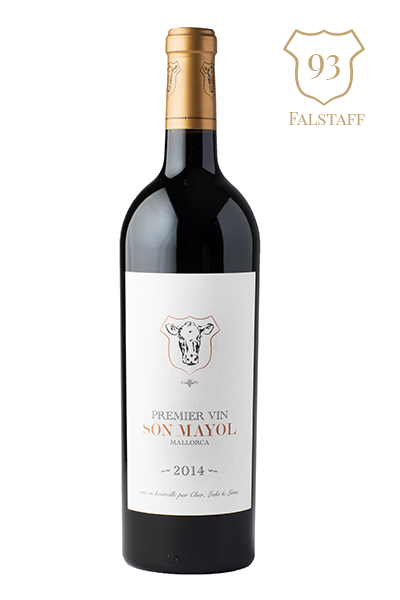 PREMIER VIN SON MAYOL is meanwhile a wine characterised by its attractive fruitiness and lower tannin content, making it a modern classic for those who prefer lighter wines. 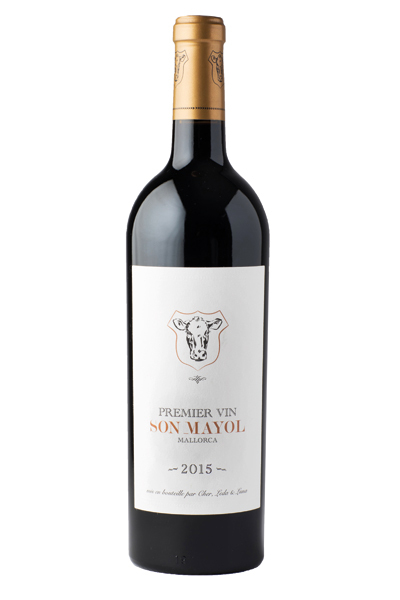 The Grand Vin 2016 by Son Mayol reaps the benefits of a special selection process at the vineyard itself: Only perfectly ripened grapes are used, resulting in a wine that is rich in extracts. This red wine has a purple sheen, while its taste is dominated by tobacco and dark fruit, as well as a high degree of minerality. The roasted flavours generated by the ageing process in oak barrels are very well incorporated into the wine, giving it added complexity. On the palate, the wine is intense and very tannic, but also fine and elegant. It has a long finish, and is distinguished by its great freshness, as well as its potency. It is also ideal for extended storage. The Premier Vin 2016 is the hallmark of its primary grape variety, the Merlot. It has a well-rounded, velvety and fruity nose. The Cabernet grapes add a solid texture, meaning it can keep extraordinarily well over time and in your wine cellar. Its taste is distinguished by new red fruit, harmoniously enhanced by vanilla and roasted notes. On the palate, it reveals its full body with silky tannins. It is the perfect choice for when you want to enjoy a light, fruity, modern wine with friends. Intense purple colour. The bouquet is reserved, elegant, hints of wood are in harmony with fruits such as blackberry, with a touch of chocolate. On the palate, potent with strong but full and elegant tannins, well balanced and mineral flavour. Very good aging potential, this wine is composed of 70% Cabernet Sauvignon for strength and elegance and 30% Merlot for fullness. Dark ruby colour with purple reflections. Somewhat closed at the first bouquet, the wine then unfolds on a hint of wood, ripe black cherries, orange peel and a touch of mineral. On the palate, the wine has a robust body with all integrated tannins, minerals and hints of black fruits. Smooth and pleasant, the palate is energetic and is overall very well balanced. A long-keeping wine. The varietal proportions of this wine are 40% Merlot and 60% Cabernet Sauvignon. Dark ruby colour with purple reflections. The bouquet is very expressive with hints of sunshine, ripe fruits such as cassis, berries with touches of vanilla. The bouquet has an ample and full approach, the tannins are elegant and fine, subtle. The final leaves a taste of black fruit on the palate. Good aging potential. It’s a modern style wine, light and pleasant to drink on all occasions. The blend consists of 65% Merlot, making it fruity and full, and 35% Cabernet Sauvignon giving it finesse and elegance. Dark ruby colour with purple reflections. The bouquet is intense with hints of black fruits, candied orange peel, a touch of cassis and tobacco. On the palate, the body is elegant with fine tannins, a pleasantly integrated acidity, a finish with ripe fruit. The style is very elegant and persistent. The proportions of grape varieties of this wine are 60% Merlot and 40% Cabernet Sauvignon. Patrick is a legendary winemaker and has advised or managed many important wineries in his home region of Bordeaux and all over the world. His most recent baby was the Bodega Son Mayol, and soon after completing the 2018 vintage, he suddenly left us. We miss him very much! He planned and carried out the grape planting, the wine-cellar extension, the wine ageing, and the staff training. Most of what the Bodega Son Mayol is today with its top-class wines is thanks to Patrick’s great knowledge, tireless dedication and deep love of winemaking. We will always have good memories of him, and are grateful to him for the positive co-operation, the friendship filled with laughter and the fantastic project he created here! As technical director, Marie is responsible for staffing and the entire process from planting to the finished wine, upholding the high quality standards every day. She grew up in Bordeaux, where she completed all her training in oenology and winery management, and has extensive experience. She has set up and managed wineries in Bordeaux, Chile, India and Russia. As a result, she speaks four languages and has familiarised herself with winegrowing in the most diverse of climatic conditions. Thanks to her long-time co-operation with Patrick and Bertrand, she and Bertrand form an experienced team that ensures the plantations and the Bodega comply with the highest standards of technology and methods of top French winegrowing. Bertrand Léon has taken over the reins of his father Patrick as consultant of the Bodega Son Mayol, ensuring Patrick’s work can continue. He completed all his training in oenology and winery management in Bordeaux, working with his father even as a young student. Since 2011, he has been the technical director of the famous Chateau d’Esclans, and also runs the Chateau Les Troix Crois family business. He is very familiar with the Bodega Son Mayol and Marie Barbé, and has even done some additional consulting in recent years. We look forward to working with Bertrand as we continue to make the highest quality wines. The Bodega Son Mayol was completed and inaugurated and began operating at the beginning of 2016. Housed in facilities designed by the renowned Spanish architect Javier Campos, the winery – with its cutting-edge, eco-friendly technology – has been designed to blend in harmoniously with the landscape of Majorca’s Tramuntana hills. Thanks to the gravitation principle, the grapes drop directly into the fermentation vats and then into the barrels without the use of pumps. It is for this reason that the facility is built on three storeys, corresponding to the different stages of the top-to-bottom process. The latest methods and technology are used to process, mature and bottle our wines, and the Bodega naturally meets the latest environmental requirements. Solar panels on the roof generate 100,000 KWh of energy per year (i.e. roughly enough to power 34 individual households), thereby more than covering the total requirement of our facilities. Excess energy is fed back into the power grid. Heat pumps are used to equalise temperatures and the facility’s grey-water output is cleaned and recycled. The building is so attractive and its location and views so unique, that we are able to rent out the reception rooms of the Bodega (300 m²/3,230 sq. ft., plus 1200 m²/12,900 sq. ft. of terrace) in spring, summer and winter for functions and celebrations (autumn is harvest time) and the Bodega can be visited during this period. The labels of our GRAND VIN SON MAYOL portray the works of Majorca’s artists. Once the wine from a particular year is ready for sale, the artists exhibit their work in the Bodega. The label of the GRAND VIN 2016 features of the piece Waiting Dreams by artist Rafa Forteza (www.rafaforteza.net). Francesca Marti (www.francescamarti.com) has supplied a piece from her “Senses and Movements” series of paintings for the label of our GRAND VIN 2014. It is associated with a major video installation, which can be viewed by clicking here. Any vineyard worth its salt can also produce top-quality olive oil. This is due to the fact that hill terraces that are too narrow for vines can be used to grow olive trees. This is a centuries-old tradition in Majorca, and Son Mayol duly possesses more than two thousand olive trees, a good number of which are more than a hundred years old. Just as we do with our wines, we do not limit ourselves to a single type of olive, but rather rely on a blend of three varieties. We also apply the same natural and careful production techniques as we do with our fine wines. We naturally market only oil from the first cold pressing and sell the olive residue on to other producers. The result is an olive oil of the very highest quality, with a smooth elegance, a hint of sharpness and attractive tones of green that make it ideal for serving with salad, fish or cheese and even dripped onto bread. Since when did cattle drink red wine and olive oil? Son Mayol started off as a farm dedicated to the natural rearing of Aberdeen Angus cattle and as a producer of top-quality meat based on environmentally sustainable breeding and proper care of livestock. Our cattle naturally drink neither of the above products, but their presence nevertheless does our vines and olive trees a power of good. They are fed on the abundant cereals, almonds and carob beans that we likewise produce on our own farm. Whether it be environmentally friendly cattle farming or wine-growing, our focus is always on working within nature’s natural framework – not against it. You can always contact your relevant supervisory authority with a complaint. Your competent supervisory authority will depend on the state of your domicile, work or alleged violation. the processing is required due to legitimate interest and there no reason to believe that you have an overriding legitimate interest in non-disclosure of your data. We adhere to the principles of data avoidance and data economy. Therefore, we only store your personal data for as long as is necessary to achieve the purposes mentioned here or for as long as the various storage periods provided for by law. After discontinuation of the respective purpose or expiration of these deadlines, the corresponding data will be routinely blocked or deleted in accordance with the statutory provisions. as well as for further administrative purposes. The processing of your personal data is based on our legitimate interest for the aforementioned purposes of data collection. We do not use your information to draw conclusions about you. The data controller and sometimes the data processer are the only recipients of your data. Anonymous information of this kind may be statistically evaluated by us to optimize our website and its underlying technology. Like many other websites, we also use so-called „cookies“. Cookies are small text files that are transferred from a website server to your hard drive. This automatically provides us certain data, such as IP address, browser used, operating system and your connection to the Internet. Cookies cannot be used to launch programs or to transfer viruses to a computer. Based on the information contained in cookies, we can facilitate smoother navigation and enable the correct display of our websites. For the receipt of the newsletter the indication of your e-mail address is sufficient. When you sign up to receive our newsletter, the data you provide will be used exclusively for this purpose. Subscribers may also be notified by email about circumstances relevant to the service or registration (such as changes to the newsletter offer or technical conditions).For an effective registration we need a valid e-mail address. In order to verify that an application is actually made by the owner of an e-mail address, we use the double opt-in procedure. For this purpose we record the order of the newsletter, the dispatch of a confirmation mail and the receipt of the requested answer. Further data is not collected. The data will be used exclusively for the newsletter and will not be passed on to third parties. The consent to the storage of your personal data and their use for the newsletter can be revoked at any time. Each newsletter has the relevant link for this. In addition, you can unsubscribe from this website at any time or inform us of your request via the contact option indicated at the end of this Privacy Notice. If you contact us by e-mail or contact form to ask questions of any sort, you also provide us your voluntary consent for the purpose of establishing contact. This requires the specification of a valid e-mail address. This serves for the assignment of the request and the subsequent answering of the same. The specification of further data is optional. The information you provide will be stored for the purpose of processing the request and for possible follow-up questions. After completing your request, personal data will automatically be deleted. This website uses Google Analytics, a web analytics service provided by Google Inc. (following: Google). Google Analytics uses so-called „cookies“, i.e. text files that are stored on your computer and that allow an analysis of your use of the website. The information generated by the cookie about your use of this website is usually transmitted to a Google server in the USA and stored there. However, due to the activation of IP anonymization on these websites, your IP address will be shortened beforehand by Google within a member state of the European Union or within a state subject to the Agreement on the European Economic Area. Only in exceptional cases will the full IP address be sent to a Google server in the US and shortened there. On behalf of the operator of this website, Google will use this information to evaluate your use of the website, to compile reports on website activity and to provide other services related to website activity and internet usage to the website operator. The IP address provided by Google Analytics as part of Google Analytics will not be merged with other Google data. You can prevent the storage of cookies in a corresponding browser setting; however, please note that if you do this, you may not be able to use all the features of this website to the fullest extent possible. In addition, you can prevent the collection of the data (including your IP address) generated by the cookie and related to your use of the website from Google and the processing of this data by Google by downloading and installing the browser plug-in available from the following link: Browser Add On to disable Google Analytics . In order to render our content correctly and in a graphically appealing manner across browsers, we use script libraries and font libraries on this website, such as: Google Webfonts (https://www.google.com/webfonts/). Google Webfonts are transferred to the cache of your browser to prevent it loading multiple times. If the browser does not support Google Web fonts or prohibits access, content will be displayed in a standard font. Accessing script libraries or font libraries automatically triggers a connection to the operator of the library. It is theoretically possible – but currently also unclear whether and if so for what purposes – that operators of such libraries collect data. On some of our websites we embed Youtube videos. The corresponding plug-ins are operated by YouTube, LLC, 901 Cherry Ave., San Bruno, CA 94066, USA. When you visit a page with the YouTube plugin, it connects to Youtube servers. Through this, Youtube is informed which pages you visit. If you are logged into your Youtube account, Youtube can assign your surfing behavior to you personally. This can be prevented by logging out of your Youtube account beforehand. Anyone who has disabled the storage of cookies for the Google Ad program will need not expect any such cookies even when watching YouTube videos. Youtube also stores non-personal usage information in other cookies. If you want to prevent this, you must block the storage of cookies in the browser.